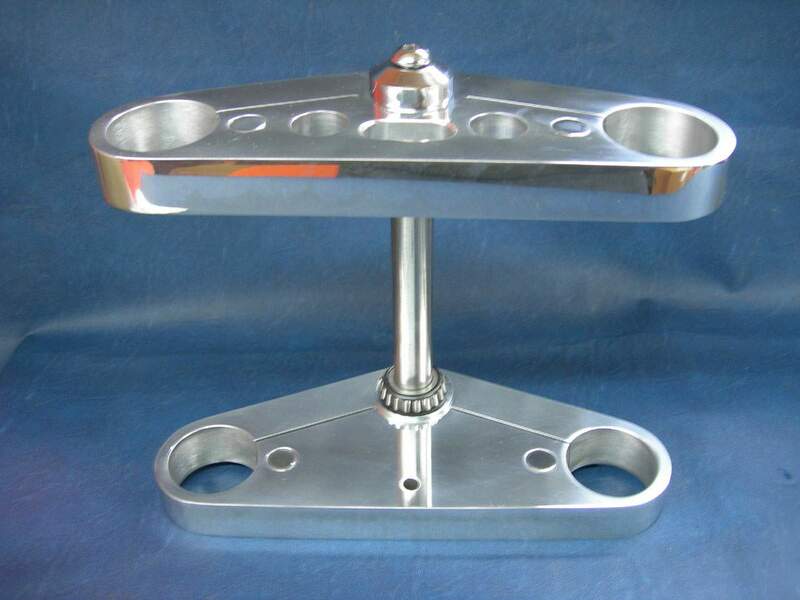 Triple Tree ("triple clamp" (US) or "yoke" (UK)) attaches the fork tubes to the frame via steering head bearings, which allow the forks to pivot from side to side, and therefore steer the motorcycle. Most bikes have upper and lower triple trees, providing two solid clamping points that keep the fork tubes parallel whilst also connecting the forks to the frame via the steering head bearings. With the tendency to employ fork legs with single action damping, fork triple trees need to be reinforced more than when the forks shared both damping roles, because the rigidity of the triple trees is relied upon to distribute the forces within the forks without flex. The triple tree is closely related to rake and trail and by changing the triple tree you can actually adjust the rake and trail. Triple trees have a dimension called off-set. It is the distance from the center of the fork tubes to the center of the neck pivot axis. It is an important factor in trail. The better manufacturers of raked triple trees reduce the off-set in order to increase trail in the final set-up. With a rake of 5 degrees added to the frame and 5 degrees added to the triple tree and a reduction of off-set in the triple tree we have a bike with a longer wheel-base, a prettier front-end and a trail dimension close to the original.